Back in November I signed up for the Schnitzel & Boo mini quilt swap. I received my partner info and got to work. I ended up using a Thimbleblossom mini pattern. I would highly suggest using starch when working with pieces this small. My partner loves red and turquoise so hopefully this will be something that she appreciates! I also added in some extra goodies in with her package. I love making the lined drawstring bags. The pattern is by Jeni Baker. They are so easy to make and are perfect as little gift bags. Hopefully my partner will like what has been sent her way. Now that this swap is over I can't believe it but my sewing list is empty. I have nothing on my "Need To Do" list. So now I guess I get to move onto my "Bucket List" for quilting! This is super easy to put together. But I thought I would write it out just in case anyone wanted to give it a try! 1. I starched all fabrics before I started cutting. 2. Make your 1/4" seam as consistent as possible! There's not extra wiggle room in this project. 3. I sewed mine together in four different quadrants before I pieced the whole top together. 1. 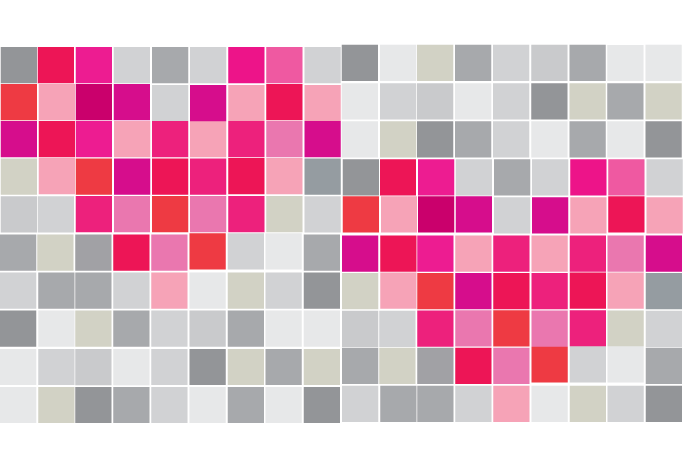 Arrange all of your 1" squares like the diagram below. 2. Sew together one quadrant at a time. I sewed the entire row then sewed the rows together. 4. Baste and quilt as desired. 5. Bind! And you have one impressively tiny pieced mug rug. If you have any questions feel free to ask. I will help as best as I can! Enjoy the tutorial and if you end up making something I would love to see pics. The McKinney MQG is swapping Valentine related mug rugs for our February meeting. 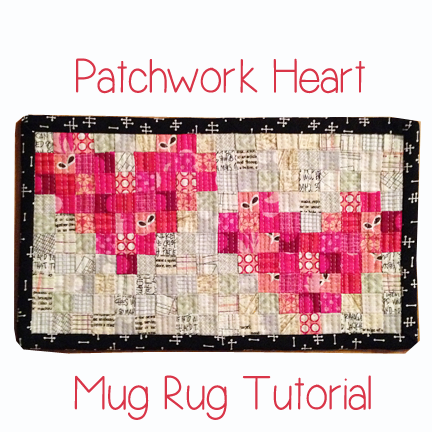 I decided to make a mug rug that had a patchwork heart and I wanted to use 1" squares that would finish 1/2". So I opened up EQ7 and started playing around and I came up with this. 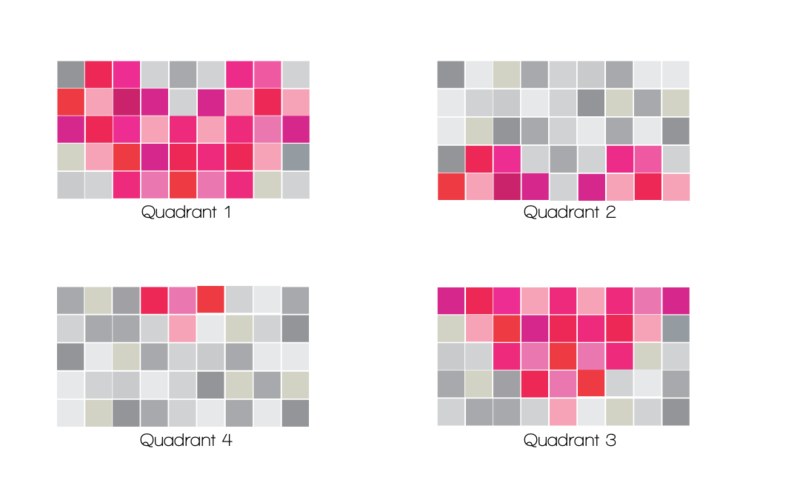 It's not perfect but working with those tiny squares isn't easy! I hope whoever receives it will enjoy it. I also added some extra goodies to the swap package. I can't wait to see what the other ladies come up with!! I always love seeing all of the different ideas when we swap items. There are so many talented ladies in our guild, we are one lucky bunch! In December, I was asked to be a part of The Stash Sewciety Bee in 2015. I don't usually sign up for bees because they are normally such a long commitment but with the amazing ladies that make up this group I couldn't say no. January's blocks are going to the amazing Jennifer (@jjarchowa). I love how these turned out and judging by the other blocks that she's already received, these should fit in nicely! I have been busy sewing lately, but unfortunately I can't share what I have been working on. But soon ... I promise!